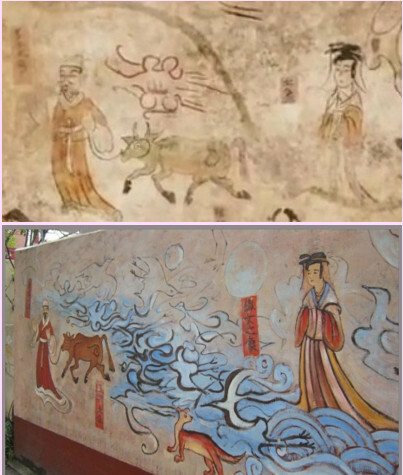 Left/Middle: An ancient painting of Nüwa and Fuxi unearthed in Xinjiang. Hanging scroll, ink and color on paper. Size 115.7 x 55.8 cm. 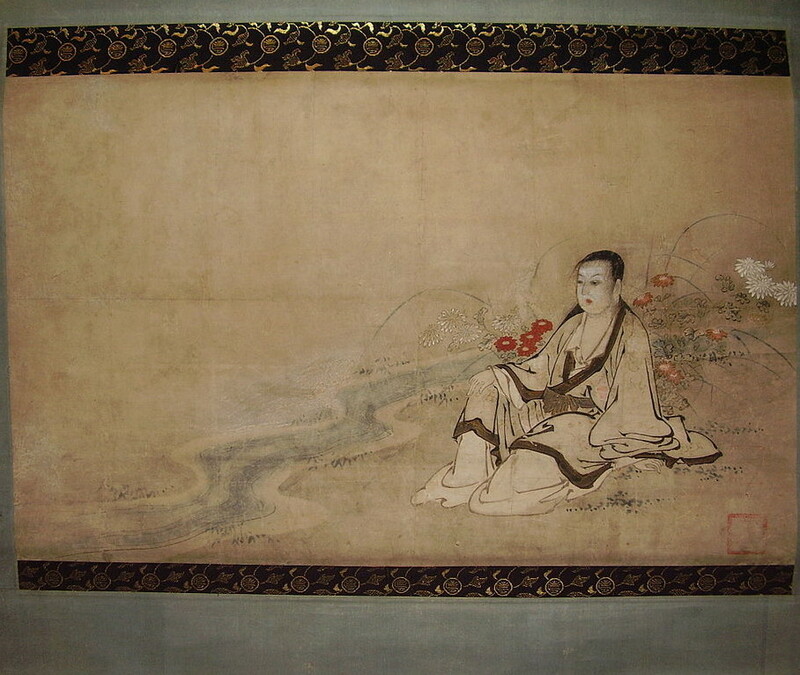 Painting is located in the Palace Museum, Beijing. carved in ivory, c. 1550–1644, Ming dynasty. The "Nine Dragons" handscroll (九龍圖), painted by the Song-Dynasty Chinese artist Chen Rong (陳容), 1244 AD, Ink and some red on paper. The entire scroll is 46.3 x 1096.4 cm. Located in the Museum of Fine Art - Boston, USA. Warning: Some browsers may have trouble displaying this image at full resolution. a butterfly flitting and fluttering around, happy with himself and doing as he pleased. He didn't know he was Zhuangzi. or a butterfly dreaming he was Zhuangzi. 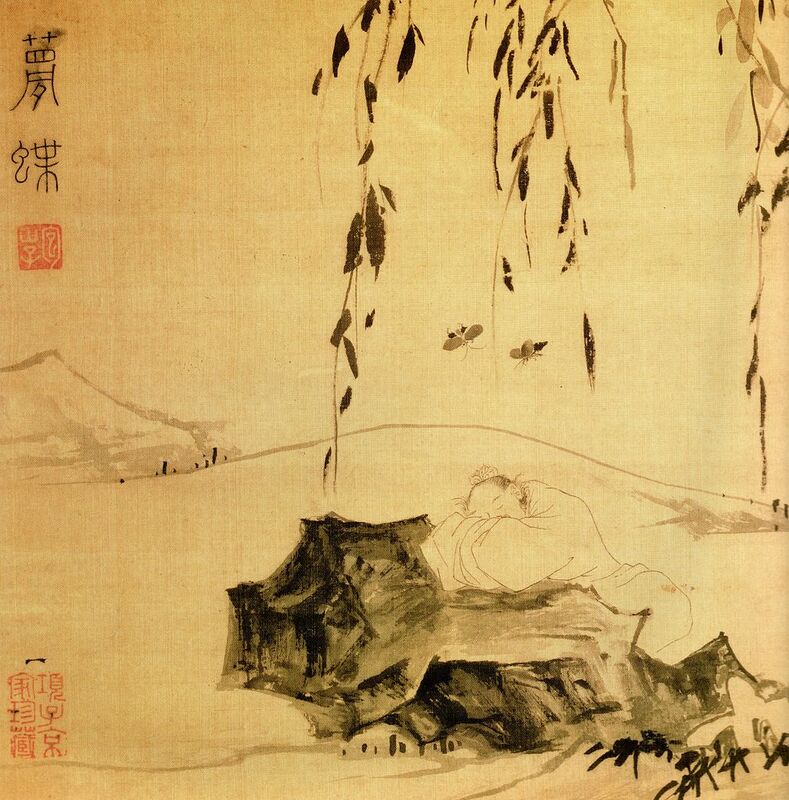 Between Zhuangzi and a butterfly there must be some distinction! This is called the Transformation of Things. he dozed off as his yellow millet was cooking in a hotel. and thus was awarded a prestigious office and soon promoted to the position of vice minister. He then married the daughter of a prosperous household and had a son and a daughter. He was promoted again and again, and finally became the prime minister. However, his success and luck attracted jealousy of others, so he was accused of crimes that caused him to lose his office. His wife then betrayed him, his children were killed by bandits, and he lost all his wealth. 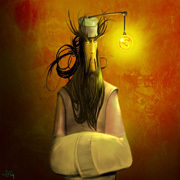 As he was dying on the street in the dream, he woke up. Although in the dream, eighteen years had passed, the whole dream actually happened in the time it took his millet to cook. The characters from his dream were actually played by Zhongli Quan in order to make him realize that one should not put too much importance on transient glory and success. 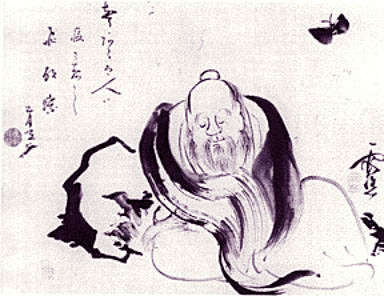 As a result, Lü went with Zhongli to discover and cultivate the Dao/Tao. This dream is known as "Dream of the Yellow Millet" (Huang Liang Meng) and is described in a writing compiled by Ma Zhiyuan in Yuan Dynasty. Reference: Joseph Campbell's Myths To Live By, p127-128. From the Liao Chai Stories of P'u Sung-ling, translated by Rose Quong, in Chinese Ghost and Love Stories (New York: Pantheon Books, 1964), pp305 ff. It is of a young Chinese scholar, Chu, who went with a friend for a stroll in the mountains. There they chanced on the ruins of a temple, where among the broken walls an old monk had established his hermitage. Catching sight of the two arriving, the old fellow, adjusting his robe, came toddling forward to show them around. There were some statues of the immortals, as well as, here and there on the remaining walls, a number of lifelike paintings of people, animals, and flowery scenes. 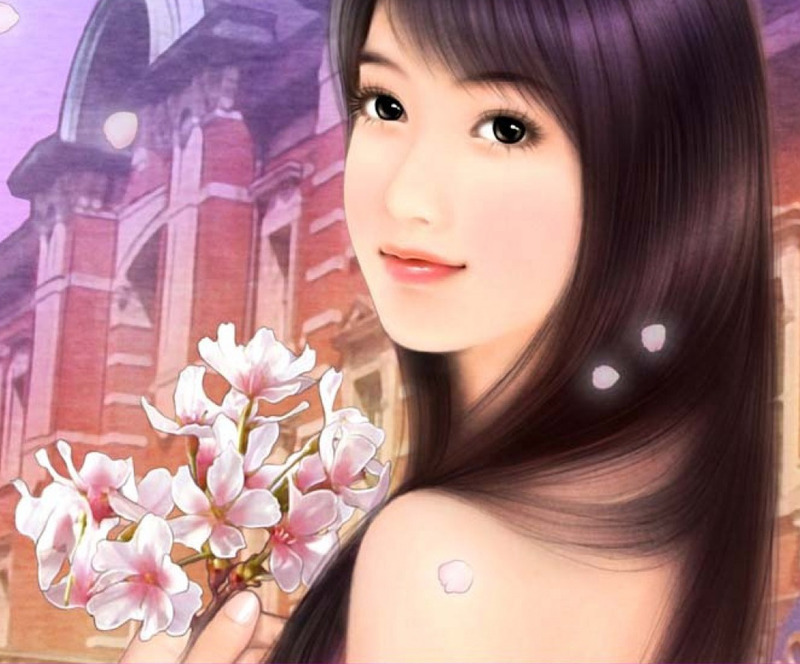 Both Chu and his friend were enchanted, and particularly so when, high on one of the walls, they noticed the view of a pretty little town with a lovely girl standing in the foreground, holding flowers in her hands. Her hair was down, which meant that she was unmarried, and Chu no sooner saw her than he was lost altogether in love. His imagination was holding him to the lovely smile on her lips, when, before he knew it – by the power of the foxy old monk, who thought to teach him a lesson – he was there in that little town street himself, and there too was that lovely girl. She gladly greeted him and led him to her home. And they became engaged immediately in a passionate affair of love that went on for several days. Her friends, discovering them living that way together, laughed and teased and said to her, “Oh, oh! And your hair is still down?” They brought enabled hairpins, and when her hair had been nicely put up, poor Chu was more in love with her than ever. However, a day came when there was heard out in the street a very frightening noise of voices, rattling chains, and heavily tramping boots, which brought them to their window, and they saw a company of imperial officers coming to scout out unregistered aliens. The terrified girl told Chu to hide, which he did. He hid beneath the bed. But then, on hearing a still greater commotion outside, he leaped out from under and, rushing to the window to look, felt his sleeves suddenly fluttering and found that he had passed right out the picture and was coming down through the air to his friend and the old monk below. The two were standing where all three had been but a few brief moments before; and when Chu, coming down, rejoined them, both he and his friend were amazed. They turned to the monk for an explanation. “Visions are born and die in those who behold them,” he said simply. “What can an old monk say?” But he raised his eyes, and they theirs, to the picture. And what do you know? The girl’s hair was up. Lü Dongbin, one of the Eight Immortals, disguises himself as a man selling tangyuan at the Broken Bridge (斷橋) near the West Lake in Hangzhou. A boy called Xu Xian (simplified Chinese: 许仙; traditional Chinese: 許仙; pinyin: Xǔ Xiān; Jyutping: Heoi2 Sin1) buys some tangyuan from Lü Dongbin without knowing that they are actually immortality pills. He does not feel hungry for the next three days after eating them, so he goes back to ask why. 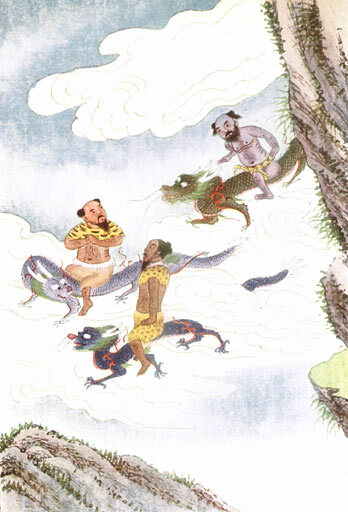 Lü Dongbin laughs and carries Xu Xian to the bridge, where he flips him upside-down and causes him to vomit the tangyuan into the lake. 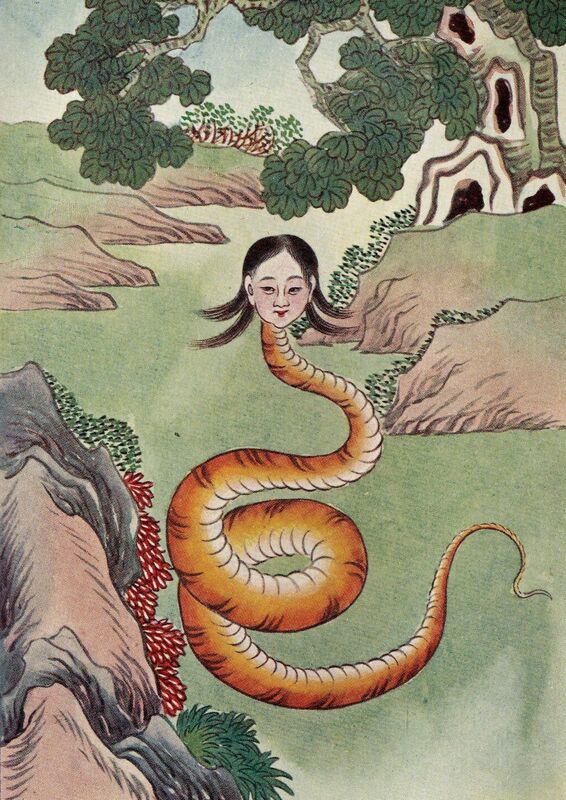 In the lake, there is a white snake spirit who has been practising Taoist magical arts in the hope of becoming an immortal after centuries of training and cultivation. She eats the pills and gains 500 years' worth of magical powers. She therefore feels grateful to Xu Xian and their fates become intertwined. There is another terrapin (or tortoise) spirit also training in the lake who did not manage to consume any of the pills; he is very jealous of the white snake. One day, the white snake sees a beggar on the bridge who has caught a green snake and wants to dig out the snake's gall and sell it. 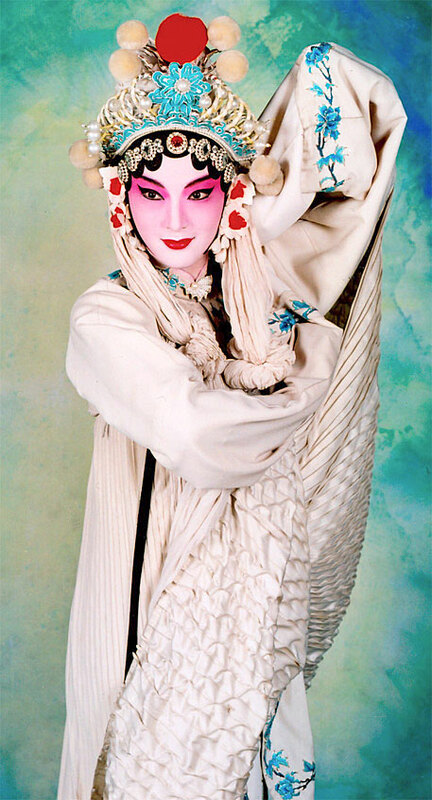 The white snake transforms into a woman and buys the green snake from the beggar, thus saving the green snake's life. 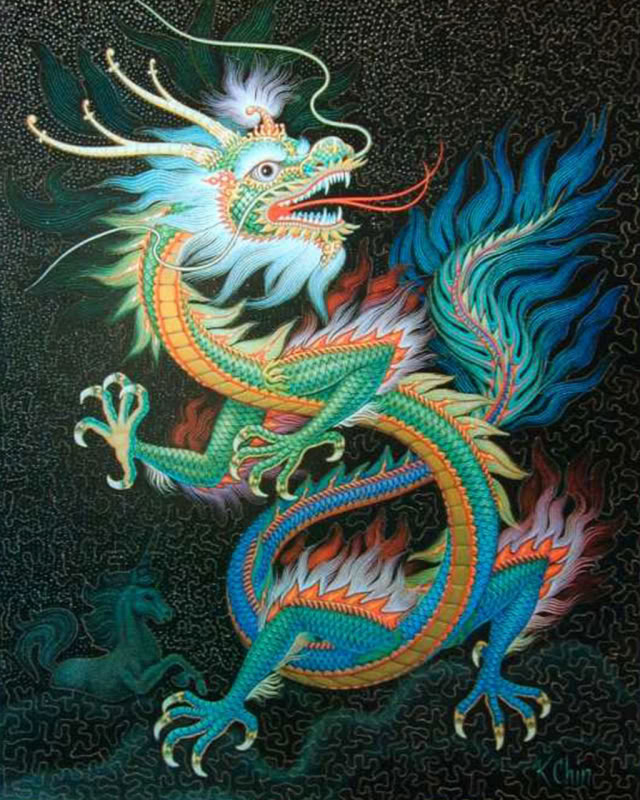 The green snake is grateful to the white snake and she regards the white snake as an elder sister. 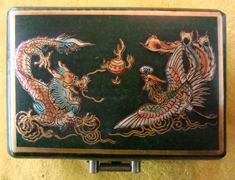 Eighteen years later, during the Qingming Festival, the white and green snakes transform themselves into two young women called Bai Suzhen (Chinese: 白素貞; pinyin: Bái Sùzhēn; Jyutping: Baak6 Sou3-zing1) and Xiaoqing (Chinese: 小青; pinyin: Xiǎoqīng; Jyutping: Siu2-cing1), respectively. They meet Xu Xian at the Broken Bridge in Hangzhou. Xu lends them his umbrella because it is raining. Xu Xian and Bai Suzhen gradually fall in love and are eventually married. They move to Zhenjiang, where they open a medicine shop. After coming back to life, Xu Xian still maintains his love for Bai Suzhen despite knowing her true identity. Fahai tries to separate them again by capturing Xu Xian and imprisoning him in Jinshan Temple (金山寺). 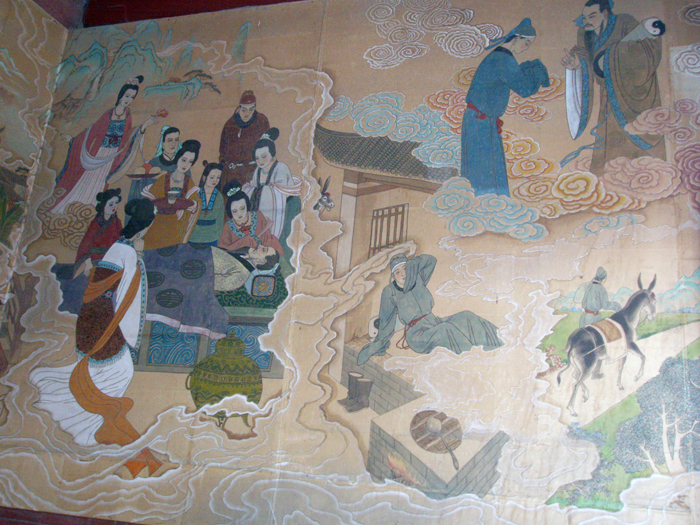 Bai Suzhen and Xiaoqing fight with Fahai to rescue Xu Xian. Bai uses her powers to flood the temple and drowns many innocent people. 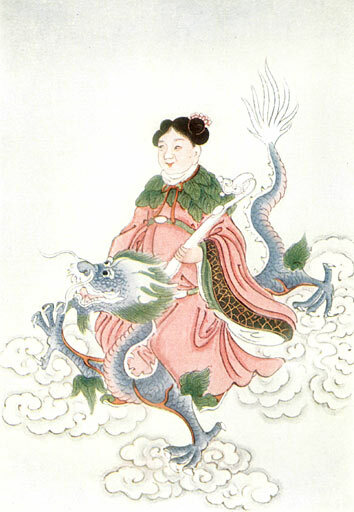 However, her powers are limited because she is already pregnant with Xu Xian's child, so she fails to save her husband. 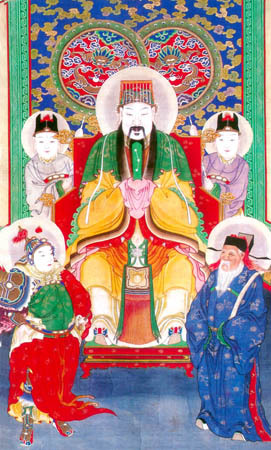 Xu Xian later manages to escape from Jinshan Temple and reunite with his wife in Hangzhou, where Bai Suzhen gives birth to their son, Xu Mengjiao (Chinese: 許夢蛟; pinyin: Xǔ Mèngjiāo; Jyutping: Heoi2 Mung6-gaau1). 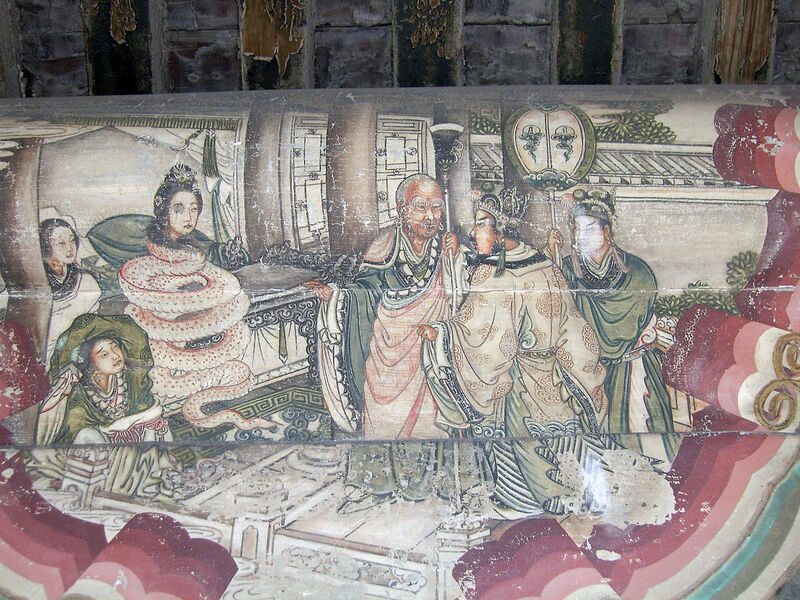 Fahai tracks them down, defeats Bai Suzhen and imprisons her in Leifeng Pagoda. Twenty years later, Xu Mengjiao earns the zhuangyuan (top scholar) degree in the imperial examination and returns home in glory to visit his parents. At the same time, Xiaoqing, who escaped when Bai Suzhen was captured by Fahai, goes to Jinshan Temple to confront Fahai and defeats him. 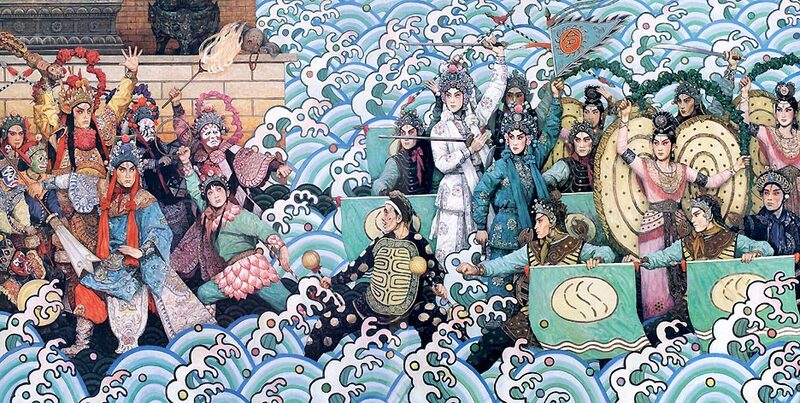 Bai Suzhen is freed from Leifeng Pagoda and reunited with her husband and son, while Fahai flees and hides inside the stomach of a crab. There is a saying that a crab's internal fat is orange because it resembles the colour of Fahai's kasaya. 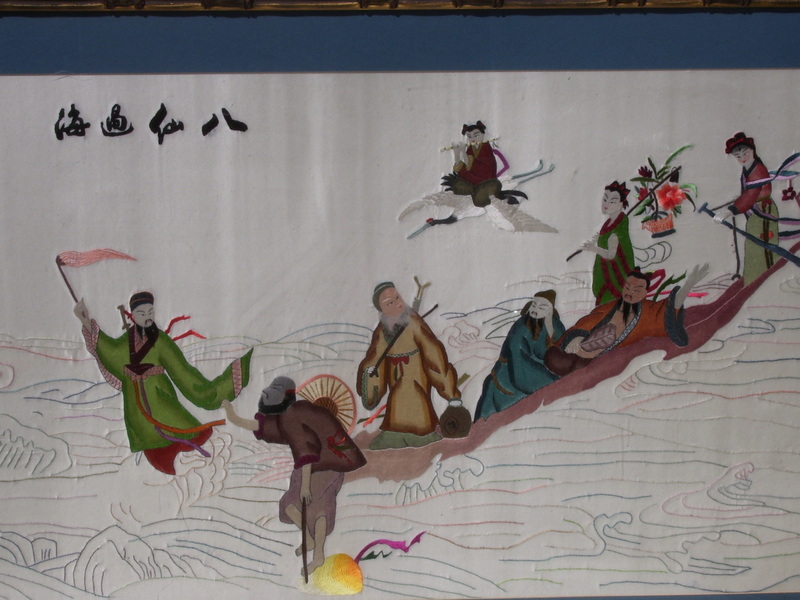 There are many tales about Chang'e, but there's well-known story regarding the origin of the Mid-Autumn Moon Festival. In a very distant past, ten suns had risen together to the heavens, thus causing hardship for the people. The archer Yi shot down nine of them and was given the elixir of immortality as a reward, but he did not consume it as he did not want to gain immortality without his beloved wife Chang'e. However, while Yi went out hunting, Fengmeng broke into his house and forced Chang'e to give up the elixir of immortality to him, but she refused to do so. 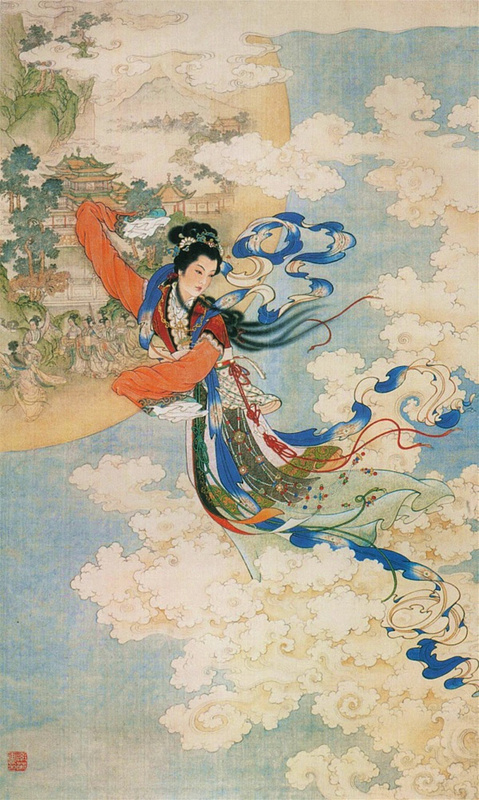 Instead, Chang'e drank it and flew upwards towards the heavens, choosing the moon as residence to be nearby her beloved husband. Yi discovered what had transpired and felt sad, so he displayed the fruits and cakes that his wife Chang'e had liked, and gave sacrifices to her. Michael Collins: Okay. We'll keep a close eye out for the bunny girl. In 2007, China launched its first lunar probe, a robotic spacecraft named Chang'e 1 in the goddess' honour. A second unmanned probe, named Chang'e 2, was launched in 2010. A third Chang'e spacecraft, a robotic lunar rover dubbed Chang'e 3, landed on the moon on Saturday, Dec. 14, 2013 at about 9:12 p.m., Beijing time, making China only the third country in the world to achieve such a moon feat after the former Soviet Union and the United States. The lander also delivered the robotic rover Yutu ("Jade Rabbit") to the lunar surface to begin its months-long driving mission. It has performed the first lunar soft landing since the Russian Luna 24 mission in 1976. 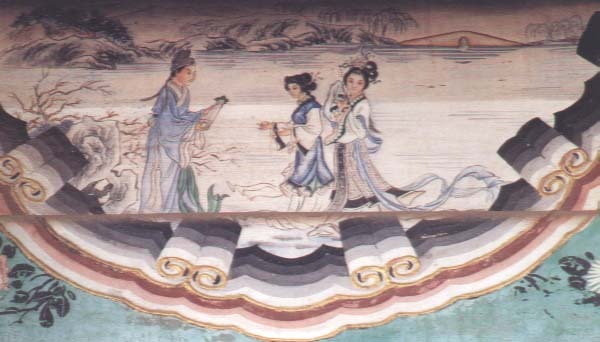 The general tale is about a love story between Zhinü (織女; the weaver girl, symbolizing Vega) and Niulang (牛郎; the cowherd, symbolizing Altair). 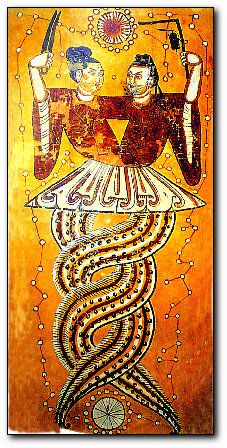 Their love was not allowed, thus they were banished to opposite sides of the Silver River (symbolizing the Milky Way). Once a year, on the 7th day of the 7th lunar month (七夕 Chinese Valentine's Day), a flock of magpies would form a bridge to reunite the lovers for one day. There are many variations of the story. The earliest-known reference to this famous myth dates back to over 2600 years ago, which was told in a poem from the Classic of Poetry. "Meeting across the Milky way"
Right: The original wall painting and modern illustration of "Cowherd and the Weaver Girl 牛郎織女"
Top: The Koguryo-era wall painting depicting "Cowherd the Weaver Girl" inside the famous Tokhung-ri Tomb (Deokheung-ri Tomb 德興里古墳), built in 408 ce, located in Nampho, North Korea. Bottom: The modern painting illustrating the above wall painting. Tanabata (七夕, meaning "Evening of the seventh"), also known as the Star Festival, is a Japanese festival originating from the Chinese Qixi (七夕) Festival. It celebrates the meeting of the deities Orihime (織り姫) and Hikoboshi (彦星) (represented by the stars Vega and Altair respectively). According to legend, the Milky Way separates these lovers, and they are allowed to meet only once a year on the seventh day of the seventh lunar month of the lunisolar calendar. On Tanabata, people write wishes on small pieces of colored paper called tanzaku (短冊) and hang them on bamboo branches.. These become beautiful wish trees. On the following day, the decorated trees are floated on a river or in the ocean and burned as an offering. There are many celebrations all over Japan, which also include parades, food stalls, colorful decorations, and fireworks. Tanabata is the story of two lovers. Princess Orihime, the seamstress, wove beautiful clothes by the heavenly river, represented by the Milky Way. Because Orihime worked so hard weaving beautiful clothes, she became sad and despaired of ever finding love. 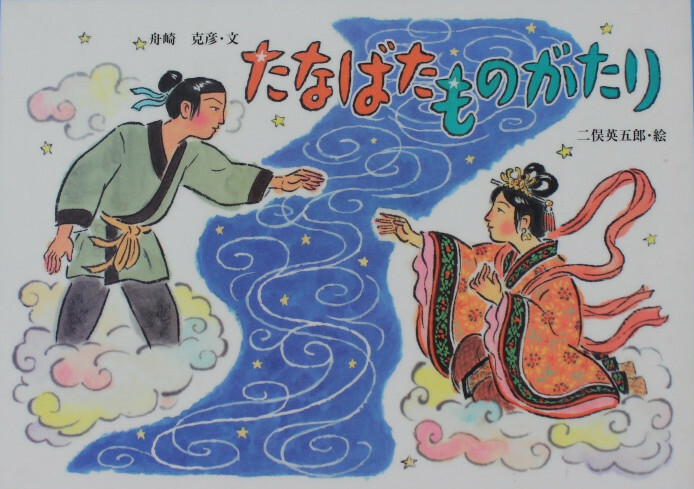 Her father, who was a God of the heavens, loved her dearly and arranged for her to meet Hikoboshi, the cow herder who lived on the other side of the Milky Way. The two fell in love instantly and married. 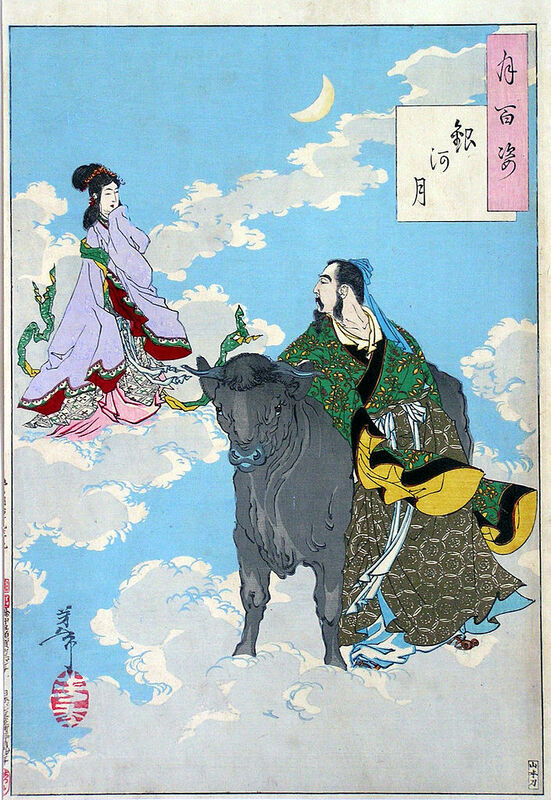 Their love and devotion was so deep that Orihime stopped weaving and Hikoboshi allowed his cows to wander the heavens. Artist: Kitao Shigemasa (Japanese, 1739–1820), Edo period. The actor Onoe Kikugorô V playing the role of Kikujidô in the dance show "Makura Jidô", which was staged in July 1892 at the Kabukiza. Also known as Ju Citong (枕慈童 pillow-boy). A young man named Jidô was under the special affection of the Emperor. 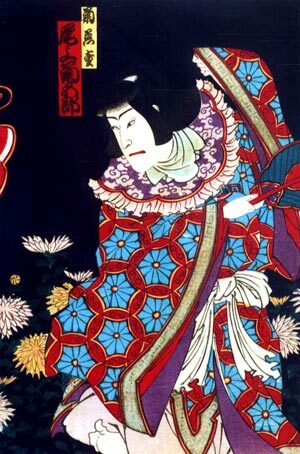 Jidô is accused of stepping over the Emperor's pillow and flees deep into the mountains. While in the mountains, Jidô writes a Buddhist verse on a chrysanthemum leaf and recites it every morning. The dew from that chrysanthemum flower turns into a magical potion of eternal youth. With this potion, Jidô is able to maintain his youthful form for seven hundred years. As he remembers the days of old, he longs for the skies of the city. The dance is a tasteful mature performance with an old-fashioned air. 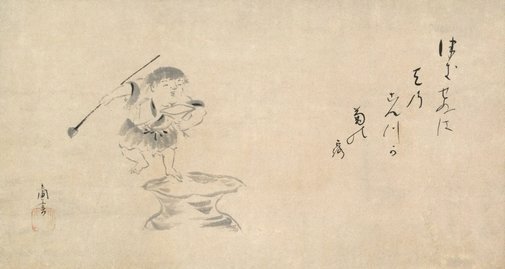 Seated at the lower right is Kikujidô (the Chrysanthemum Boy). He holds a brush in his right hand, chrysanthemum leaves in his left hand, and is surrounded by blooming chrysanthemums. He would write on chrysanthemum leaves and drop them into the stream. 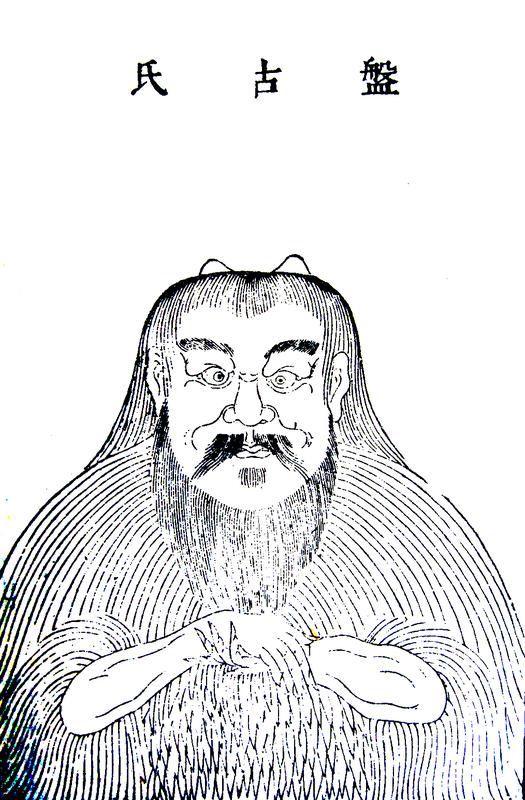 Kikujidô was an attendant to a 10th-century BC Chinese emperor Muh Wang. Rivals forced his exile due to a minor transgression. The emperor taught him a magical sentence from the historical Buddha to protect Kikujidô from harm. He wrote this phrase on chrysanthemum leaves that floated down the river back to civilization. Water that washed the writing off the leaves became an elixir of everlasting youth. 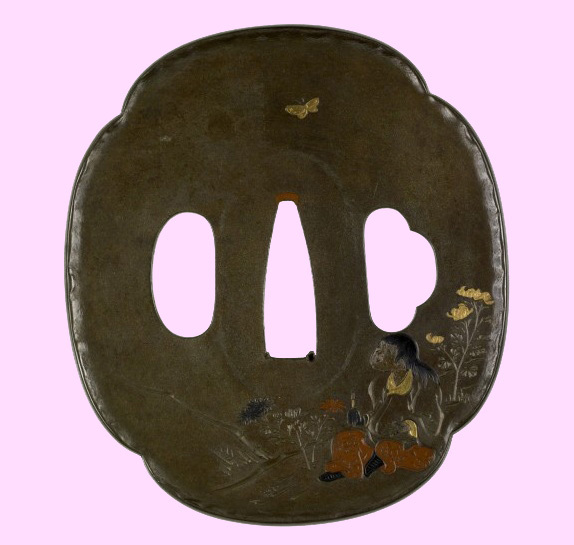 The stream that ran through Kikujidô's place of exile is on the back of the tsuba. 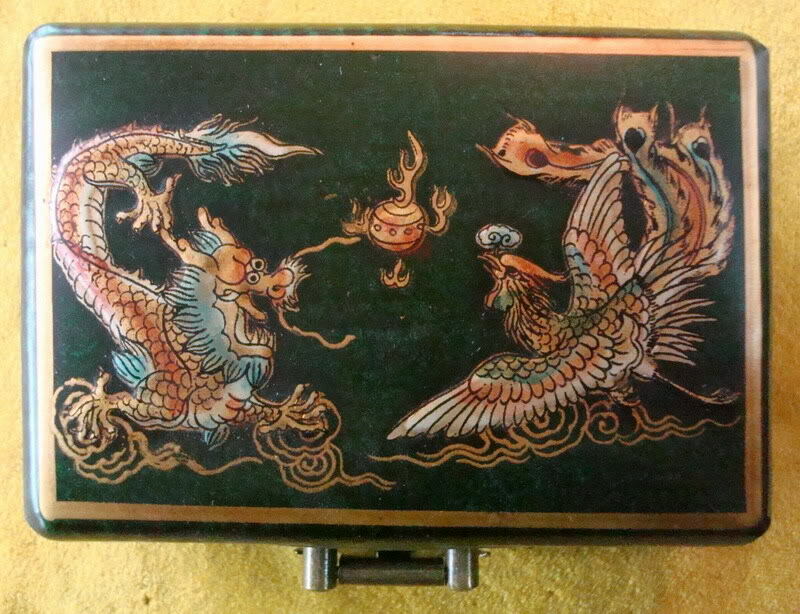 Legend has it that Kikujidô was a servant boy to the emperor Mu of the Zhou dynasty. He was sent in exile to Li County of Nanyang Prefecture [present day Henan Province] where he became immortal by drinking the water of the Chrysanthemum River. 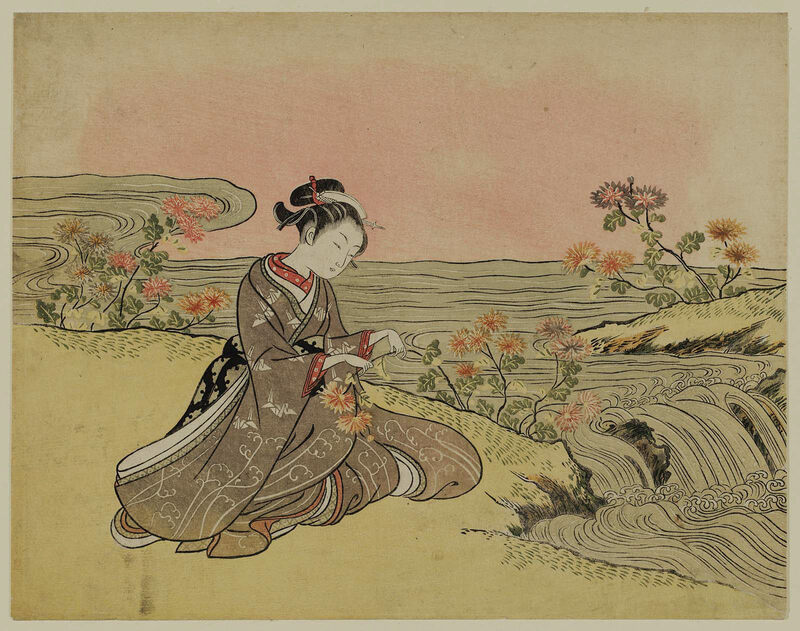 It was believed that the river water contained the dew from chrysanthemums growing along its upper stream and very sweet, and that one who drank it gained a long life.